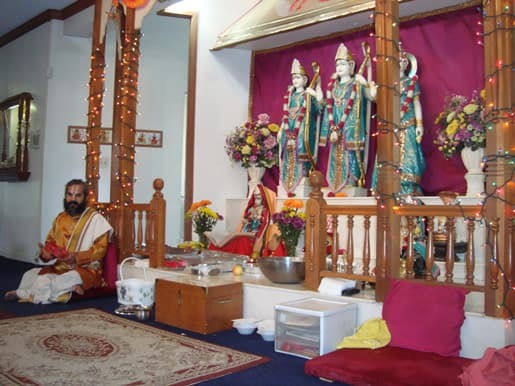 Like most Hindu temples, the temple of the Hindu American Religious Institute (Hari Temple New Cumberland) houses various deities of the Hindu tradition. It is also home to one of the most sacred figures of the Jain tradition-Lord Mahaveer, the twenty-fourth Tirthankar, or enlightened world-teacher, of our cosmic era. Non-Hindus, particularly those from religious traditions that do not use images, often do not understand the role of the deities and their images, or murtis, in the Hindu tradition. An image is a way to focus one’s loving attention and devotion on a specific form of the Divine Reality. Brahman, the Divine Reality, is everywhere and in everyone. In order to relate to this infinite Reality in a more personal way, Brahman is happy to manifest in as many forms as we living beings need in order to draw nearer to our divine source. This is neither monotheism nor polytheism, as these are conventionally understood, though it has aspects of both. It is the idea of an omnipresent divinity that can be approached through infinite forms and in infinite ways. The deities of the Hindu tradition are forms that the Divine Reality assumes in order to draw us ever nearer, evoking the experience of bhakti, or sacred devotion, filling the devotee’s heart with love and bliss. Every Hindu temple, or mandir, has a central deity. 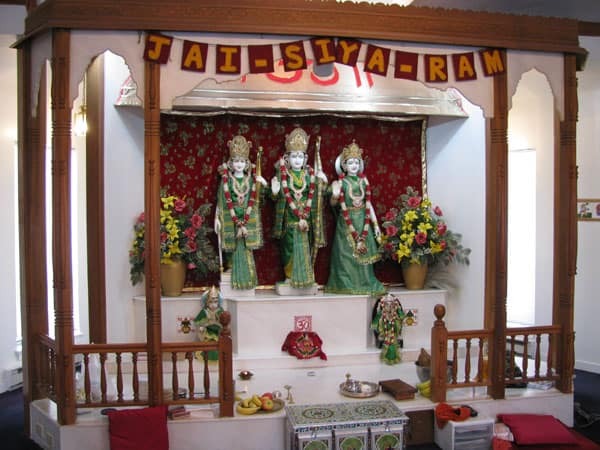 The central deity of HARI is Lord Rama, or Lord Ram, as his name is pronounced in many parts of India. Lord Rama is an avatar, or incarnation, of Lord Vishnu, the Preserver of Dharma. (Dharma is the cosmic order, including the laws of nature, as well as the laws of society: all our duties and moral obligations.) 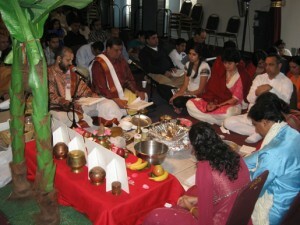 His life story is presented in the Ramayana, one of the sacred scriptures of Hinduism. His wife, Sitadevi, stands to his left (or to the right, from the point of view of one who is facing his image). Sitadevi is also a divine incarnation: of Goddess Lakshmi, the wife of Lord Vishnu. 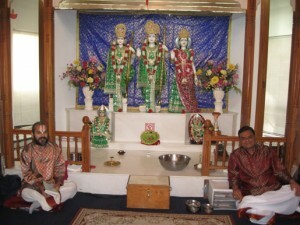 To the right of Lord Rama (the viewer’s left) is Lakshmana, his brother. The central altar at HARI also includes smaller images of other important deities, such as Lord Hanuman, who takes the form of an ape. 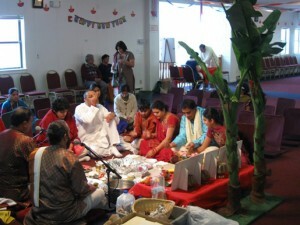 He is a great helper to Rama in the story of the Ramayana. There is also Lord Ganesha, or Lord Ganesh, who is depicted with the head of an elephant. He is the remover of obstacles. His elephant head represents divine wisdom and strength. The central altar also has a small image of the baby Lord Krishna, as well as a Shiva Linga (the abstract form of Lord Shiva), which is guarded by Nandi, the bull, who serves as Lord Shiva’s vehicle (or vahana), and the symbol Om, which is an especially sacred mantra, or prayer, that symbolizes the infinite Brahman. Lord Venkateswara Swami is a form of Lord Vishnu. His main shrine is in Tirupathi, in southern India, where he is especially popular. He is also known as Balaji, “the powerful one.” His gaze is so powerful that the eyes of the original image are kept covered.